It captures the complexity behind building a railway. In August of 1867, a band of Cheyennes in Nebraska had an idea for thwarting the railroads that were porting unwanted change through their homelands. Tying a "big stick" to the tracks, they cheered as it derailed a handcar, prompting them to slaughter all but one of the passengers. Emboldened, they proceeded to rip apart the track itself, and their efforts were rewarded soon after when a freight train wrecked and burst into flames as it tumbled into a ravine. It's worth wondering if the history of the American West would have been different if this tactic had been used more often. 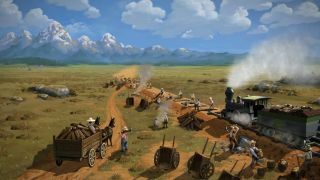 But there's none of that in Railway Empire (releasing in January), even though the campaign's opening chapter also kicks off on the flat, tutorial-friendly expanses of the Great Plains in the 1860s. The map itself is suitably geographically accurate, with the gentle ripples of the plains erupting into the crests of the Rocky Mountains, but much like this history, it's only the broad strokes of the real thing. This gives direction in both the campaign and the scenario mode—which tasks you with projects like rebuilding the South's railroad network after the Civil War—but I wouldn't go into Railway Empire expecting to learn much. Something, I believe, is lost in the approach. You may be guided through the tutorial by Thomas Clark Durant, one of the head honchos of Union Pacific as it aimed to complete the eastern half of the Transcontinental Railroad, but the map itself is sprinkled with cities like Miles City, Montana and Grand Junction, Colorado that didn’t even exist in the 1860s. Thunderstorms sometimes obscure parts of the map, but there's no sign of the buffalo herds that were driven to near-extinction partly to clear the path for the iron horses. As entertaining as Railway Empire can be, it often comes off like a die-hard capitalist's reverie, free of all the little inconveniences aside from direct competition that would prevent a profit. But it’s fun for what it is. I've known folks who think railways are little more complex than the train sets that chug along beneath Christmas trees, but Railway Empire does a good job of showcasing their complexity. Consider the actual act of laying tracks. The shortest route between two towns may be the fastest (and the least expensive, as the projected expenditures usually show), but it also means you’re missing out on picking up out-of-the-way goods like wheat and cattle on the path from Omaha to Denver. The idea, then, is to put small stations near these farms so you can more easily transport their goods to the cities who want them. Other factors must be considered as well, such as smartly placed supply stations on long stretches of track or the need for brief stretches of parallel tracks so trains can pass each other with minimal delays. Tracks at train stations need to aligned properly to meet tracks coming in from other cities. In later chapters, when the railroads start getting more clout, you’re even allowed to build structures like universities to attract more people to the towns you helped to thrive, which in turn means more profit for you. Beyond that, I could pump research points into new technologies for new locomotives and construction methods for even greater efficiency. This kind of depth could have gotten out of control in other hands, but Railway Empire keeps it fun by sticking to an overseer's perspective. That means that while I often have to deal with the challenge of laying tracks through mountains, I’m more concerned with finding the money to do it. The game itself automatically cuts into the peaks without the need to figure out how much dynamite I’d need, and I was happy to discover I could easily nudge the projected line up and down in order to stay on flat land. A slight mouse click to avoid a mountain range sometimes saved me millions of dollars. Along the same lines, the AI is usually smart enough to keep me from worrying about what the trains are doing on the routes I've set for them: my main job is making sure the trains go to optimal destinations, never have to worry about running into each other, and check off the multiple objectives needed to finish each scenario I initially worried that I found this relatively hands-off approach a little too satisfying and likely to disappoint players who prefer more micromanagement, but I grew to appreciate being able to focus my attention on broader matters once the campaign and 11 scenarios started facing me off with competitors. The campaign, in fact, is smartly designed to ease you into Railway Empire’s challenges, with the opening chapter starting on the easy contours of the Great Plains in the 1860s but then jumping backward to the 1830s to pit you against competitors on the East Coast. The setting then shifts to Civil War logistics, then to building bridges over the Mississippi River, and at last to the western half of the Transcontinental Railroad as it cuts is dangerous path through the mountains of America’s far west. Despite its seeming focus on steam and iron, Railway Empire also servers as a reminder of the major role the natural landscape played in the history of the United States. The historian in me would have liked to have seen the actual history used to greater effect, but Railway Empire's existing design comes into its own with the "Free Mode," which lets you build your networks free of objectives or period-specific limits on the technology tree. You can also choose any one of the player characters you wish in order to take full advantage of their respective bonuses, whether it's the Trickster's 20 percent discount on locomotives or auctions or the Industrialist's 5 percent higher freight prices. The Free Mode also works for the setting, which, for all my quibbling, is a smart one. The mid-19th century saw the U.S. giddy with the potential of a shockingly effective new transportation technology and, for better or for worse, the trains hastened the settlement of the west far sooner than anyone initially imagined. Setting it later would have been the story of humdrum maintenance and even decay, but in Railway Empire there's constant excitement as the rails snake across formerly empty expanses of prairie.